Non-governmental organizations (NGOs) are often portrayed as forces for good that promote universal human rights and international development in a non-partisan manner. This perception produces a “halo effect” around NGOs, which enhances their soft power while reducing public scrutiny of their activities and accountability. Yet growing evidence demonstrates that many NGOs have abandoned universality to engage in partisan advocacy on controversial and divisive issues, such as the Arab-Israel conflict. In Canada, many NGOs that have received government funding from the Canadian International Development Agency (CIDS), the International Development Research Center (IDRC), and other government frameworks promote strident advocacy under the guise of raising public awareness about international development and human rights. A number of Canadian-funded NGOs are active, to varying degrees, in promoting the strategy adopted at the 2001 World Conference Against Racism (WCAR) NGO Forum in Durban, which explicitly adopted the goal of promoting the complete international isolation of Israel. The implementation of the Durban strategy is based on tactic such as BDS (boycotts, divestments and sanctions) that target Israel, “lawfare” cases directed at Israeli officials using universal jurisdiction statutes, and repeated allegations of human rights abuses and violations of international law. Non-governmental organizations (NGOs) are often portrayed as forces for good that promote universal human rights and international development in a non-partisan manner. This perception produces a “halo effect” around NGOs, which enhances their soft power while reducing public scrutiny of their activities and accountability. Yet growing evidence demonstrates that many NGOs have abandoned universality to engage in partisan advocacy on controversial and divisive issues, such as the Arab-Israeli conflict. In Canada, many NGOs that have received government funding from the Canadian International Development Agency (CIDA), the International Development Research Centre (IDRC), and other government frameworks promote strident advocacy under the guise of raising public awareness about international development and human rights. Although this advocacy is often inconsistent with the principle of universality as well as Canada’s foreign policy, it is shown to be encouraged to varying degrees by the government agencies responsible for administering public funding. 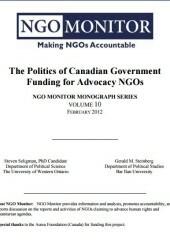 This paper examines four NGOs that received Canadian government funding while promoting partisan advocacy on the Arab-Israeli conflict, and assesses both the advocacy activities of the NGOs and the governmental processes that resulted in the allocation of public funds to the NGOs.